A pool waterfall has to start with a source of water. This source is usually the pool itself. In a pool waterfall, a series of pipes are used to connect the pool at the bottom of the water feature to the spout of the water feature near the top. Most of this plumbing is concealed within the waterfall itself. This protects the plumbing from being damaged as well as protects the swimmers in the pool from getting cut or hurt by pipe ends in the pool. Because of gravity, the water has to get a push to be able to make it from the pool end of the plumbing to the spout. This is where a waterfall pump is used. The pump takes air from the area surrounding it, and pumps it through the pipes. The force of the air behind the water forces the water from the pool and up to the spout. Once the water has been pumped from the plumbing by the pump, it will eventually hit a spout. 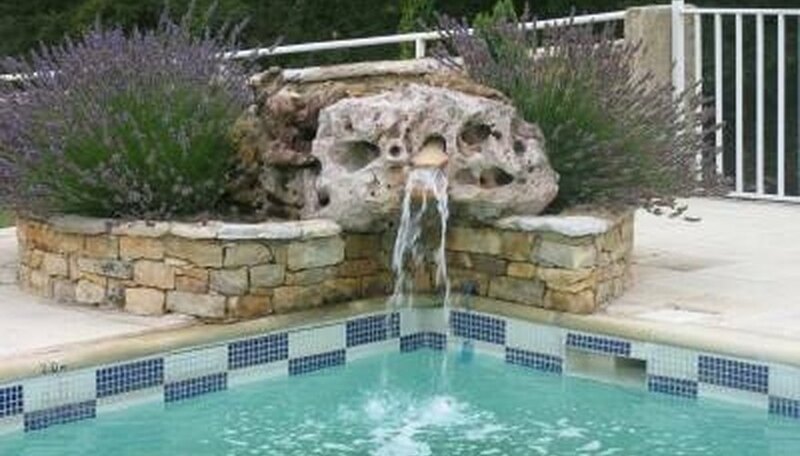 Spouts vary depending on the size, quality, and cost of the pool waterfall. Spout systems can be as simple as a single round output similar to a garden hose, to a series of water exits to spread the water out across the entire water feature. Water output also varies from a slight trickle to a full waterfall effect dependent upon the size of the spout's exit hole. Some waterfalls will dump the water from the waterfall directly back into the pool. These systems rely on the pool's filtration system to filter out any debris that may have been picked up inside the plumbing, or on top the waterfall itself. However, in some applications, the water will run through a filter before being sent back into the pool. The water is recycled, and this process continues as long as their is water in the pool and the pump is turned on.